As you read a bit more about us, you'll find the secret to our success is simple. We represent our clients the way we ourselves would want to be represented-Aggressively. Fairly. Ethically. 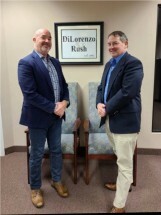 DiLorenzo & Rush-founded in 1997 and located in northern New Jersey and New York City-has a respected track record. One that speaks for itself. But, as a general overview, here is who we are, what we believe, what you can expect. Two top-notch attorneys provide a broad range of legal services to individual and business clients throughout northern New Jersey, New York City, and Southern New York State. Our attorneys possess sterling academic credentials, strong community ties, and a deep commitment to your success. We demonstrate the strictest personal and professional ethics. Above all, we are passionately committed to the needs of our clients. We utilize state-of the-art technology and cost-effective methods to provide services in a timely, client-oriented manner. That means we return your phone calls promptly, speak plainly, report regularly on your case, and are up front and ethical about our fees. In short, at our very core, we focus on each client's background, needs, and goals. That's where we start. We never stray from the idea that your needs set our course!